Need roof repair? Need roof replacement? Need Roof Installation? Alternative Energy, LLC offers affordable roof repair, replacement and installation in Phoenix, Arizona and surrounding areas. Get a free roofing inspection by giving us a call or filling out our short contact form. One of our roofing contractors will get in touch with you to set up a roofing inspection. Common search phrases used to find our roofing services include: roof repair service, flat roof repair, roof repairs, commercial roof repair, roofing contractors near me, roofing repair, tile roofing company, roof inspection, residential roof repair, tile roof repair, roof repair company, roof repair near me, roof contractors and flat roof replacement. 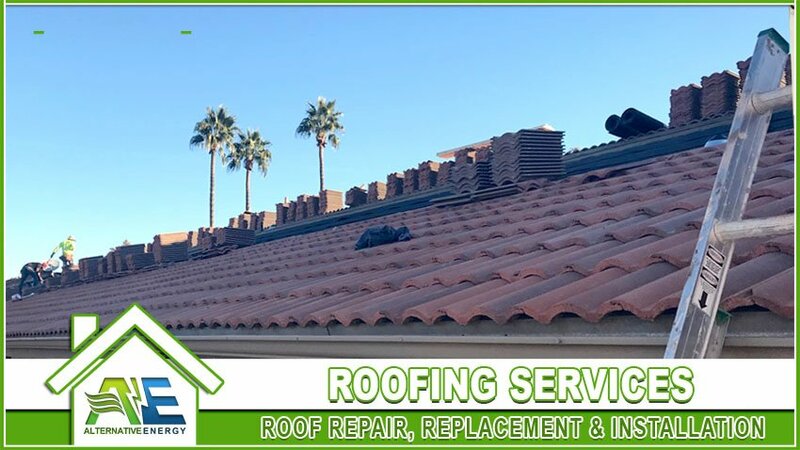 We offer roofing services to the Phoenix Valley including: Phoenix, Mesa, Tempe, Chandler, Peoria, Surprise, Glendale and more. We offer free roof inspections for the purpose of a roof repair, roof replacement or new roof installation. We offer residential and commercial roofing repair services for tile, shingle, foam and flat roofing systems. Most of the time simply replacing roofing shingles will get your shingle roof back in perfect shape. We offer shingle roof repair to help with replacing missing, damaged or worn roofing shingles. We can also inspect the underlayment to make sure it is still in good condition. Shingle roof underlayment is what stops water from entering your home. We provide flat roof repair for all types of flat roofing systems, including: build up, shingle, modified bitumen, PVC, cool flat, rubber membrane, TPO, EPDM, metal and spray foam roofing systems. We offer emergency roof repair if you have water leaking through your ceiling or you have some other type of roofing emergency. We can send our emergency roofing contractors out to your residence or business to assess the roof damage and offer an affordable repair estimate to fix it up fast! Have a leaking roof? We are experts in finding and fixing roof leaks! We offer roof leak detection services to help you find out where your water leak is coming from and offer an affordable roof repair estimate to fix it for you. We have years of experience in tracking down roof leaks and know all the common places where water likes to hide. Need us to fix a roof leak? We offer affordable roof leak repair services. Water damage in Phoenix costs homeowners thousands of dollars to repair. Keep that money in your pocket by fixing your roof leak as fast as possible. Water will eventually make its way into your ceiling, walls and flooring; damaging your home and personal belongings. Looking for roof replacement services? We can handle all types of roof replacements! Remove and replace tile replacement is one of the best options you can choose. This is where we remove your current roofing tiles, replace the underlayment and then put the tiles back in their place. R&R tile replacement vs replacing with new tile roofing shingles will save you a ton of money! We can install nearly any type of roofing system you can think of! Need roof installation services? We can help with that too. We have experience installing all types of roofing systems in the Phoenix, Arizona areas. Read our most frequently asked questions about our roofing services. According to Roofing Calculator, the average cost of roof repair is about $650. The average homeowner paid between $300 -$1,100 for roofing repairs in 2018.